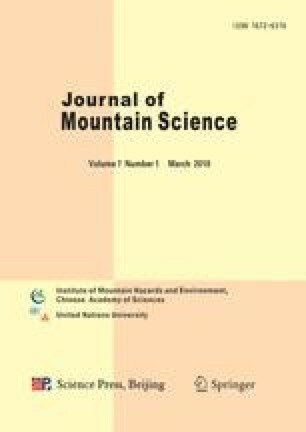 In the last few decades, a large quantity of research has been performed to elucidate the current behavior of glaciers in southern Chile, especially with respect to the volumetric changes in the outlets of the Northern and Southern Patagonian Icefields (NPI and SPI, respectively). Calculations have shown a generalized thinning and withdrawal, which greatly contributes to the increase in sea level attributed to the ice melt from non-polar glaciers. However, these icefields are surrounded by many small icecaps, which have yet to be studied in detail. A precise estimation of the volume of ice located in these mountain chains could provide new information with respect to this area’s exact contribution to the increase in sea level. Thus, this study presents an inventory of relatively small Northern Patagonian glaciers in the surrounding of the three summits: Mount Queulat, and the Macá and Hudson volcanoes. The study used remote sensing techniques in a GIS environment to determine the margins, surface areas, thickness changes and hypsometry for the glaciated zones. Landsat images from different dates were analyzed using standard band ratio and screen delineation techniques. Additionally, digital elevation models from different dates were compared using map algebra, calculating thickness changes. Based on the results, we propose that there are important volumetric changes in the glaciers studied, which could be explained by precipitation trends in a general context, and an influence of the glaciers’ sizes in some local response. Therefore, we suggest the exact contribution of the Patagonia to the increase in sea level corresponds to a regional pattern rather than just the behavior of a single ice field. Gamache, M. 2004. Free and low cost datasets for international mountain cartography, available at 〈http://www.icc.es/workshop/abstracts/ica_paper_web3.pdf〉 (last access, december 2008).